Name my new puppy contest! 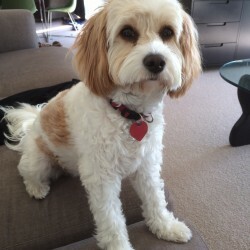 You may or may not know that I have a lovely Cavoodle named Brandy. She’s now 15 months old and she needs a play mate. She’s quite an active wee girl and loves her long morning walks but when I try to write she’s at me the whole time. When I sit at my desk to work she will sit quietly underneath it, but I do most of my writing using a lap desk as it’s better for my neck and shoulders. When I’m sitting on my bed or on the sofa writing, she believes it’s time to play. I have been taking her to doggie day care two days a week and she loves it there with the other dogs. Then, when I was visiting with my Dad in Canada, they have two dogs and I saw the friendship and thought Brandy needs a brother. I live in the country and we have a huge section and it would be really fun for her to have a little friend. 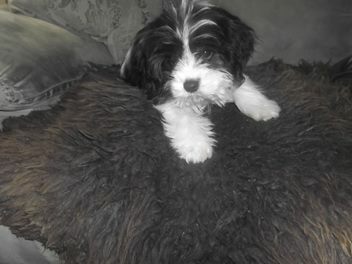 I’ve found a black and white male Cavoodle and I pick him up on 26 August. He will be 18 weeks old when I get to collect him, and I need a name for him. I googled the top 50 male dog names and there are quite a few I like. So many in fact, I can’t pick one. What do you think the little puppy’s name should be? He’s a Cavoodle too, and black and white. I shall select one person who leaves a comment with a name suggestion either here or on my Facebook page, as a winner and they will win an autographed copy of WORTH ANY PRICE by Lisa Kleypas. Open internationally, closes on August 26th 2015. You can enter as many times as you’d like either in the comments below or on my Facebook post. LOL, is that your favorite desert? Bangle is unusual, nice too. I love Sebastian, he’d be called Seb, wouldn’t he. Scouts good too. My Grandfather was Tommy. I wonder if the personality fits? He does look like a Blackie! Brandy will be very happy to have a playmate. The little guy reminds me of my male black and white cat… Neo. His full name is Neosporin and we call him Neo for short. Sebastian would be my choice. It’s the name for a rake who loves his Brandy. LOL, that’s a good point. I’m hoping he will become Brandy’s best friend. I too love the name Sebastian! I wrote A Promise of More for Sebastian. I think it would be a good name as I could shorten to Seb. my sister in law has a havenese that looks just like your new one and she name hers Tao which is short and sweet.